An alliance of Kurdish and Arab fighters, backed by U.S. airstrikes, advanced on an Islamic State of Iraq and Levant (ISIL) stronghold in northern Syria on June 23. 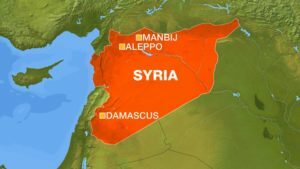 “Fierce street fighting” was reported as Syrian Democratic Forces (SDF) entered Manbij, the Syrian Observatory for Human Rights said. “The SDF entered Manbij from the south under cover of coalition air raids,” said Observatory chief Rami Abdel Rahman, adding that the SDF was able to break through ISIL’s defenses a few hours after taking control of a village on the city’s southwestern outskirts. ISIL has held Manbij, which had population of about 120,000 before the start of Syria’s civil war in 2011, since 2014. The city is a key stop on ISIL’s supply route from the Turkish border to its de facto Syrian capital of Raqqa. Abdel Rahman said the SDF forces were facing booby-traps “planted by the jihadists to try to prevent the loss of the city.” At least two SDF fighters died when a bomb went off in a residential building. The SDF advance on Manbij, which began on May 31, was slowed as ISIL fought back and carried out almost daily suicide bombings, the Observatory reported.